Come see this beautiful city and you'll be surprised at how amazing the people and experiences are. For those who want to ensure they do not miss the highlights of a well planned and once-in-a-lifetime journey, we recommend pre-booking our private excursions throughout our destinations. Our guides are all highly experienced and can bring many sights and attractions to life with their somewhat endless knowledge and enthusiasm for their own countries and cities. All excursions are private with the prices based on a minimum of 2 passengers sharing a car and the services of our guides. For passengers travelling on their own and those in larger groups than two, separate prices exist. Get your bearings before delving beneath the surface of Moscow. This orientation tour is an introduction to all the most famous sights and a few less well-known ones, to give you the first taste of Russia’s intriguing capital. 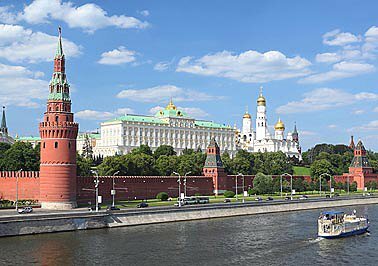 If Russia has one single landmark that could be regarded as its centre, the Moscow Kremlin must be it. Much flows from here - the Kremlin has been the seat of power since the days of Ivan the Great. It is also central to any visit to Moscow, with its three great Cathedrals, two churches, countless towers, palaces, museums and galleries. The Kremlin is also the beating heart of Russia’s political world and the President’s official residence. The imposing walls house a number of stunning cathedrals and monuments as well as the Armory museum collection, the sumptuous collection of Russia's imperial treasures. Czar's Treasures Collection is showcased in what is called the Armory Chambers Museum. Despite its name, it is a vast and fascinating repository that holds an exquisite & unrivaled selection of artifacts revealing Russia’s rich historical and cultural heritage, including the world famous Faberge Easter Eggs collection. Other highlights include the throne of Ivan the Terrible, the ceremonial carriage given to Boris Godunov by James I, the gold and sable Crown of Monomakh, which was a gift to the father of Moscow's founder from Byzantium's Constantin IX, and which conferred divine authority on all Russia's rulers until the reign of Peter the Great. Moscow's Metro System is an extraordinary sight. Intricately decorated, it is definitely an immense museum in itself. Dating from the early 1930’s, Moscow’s metro system is one of the most-used subway systems in the world. It definitely stands out as second to none in terms of cleanliness, efficiency and architectural beauty. Some of the historical metro stations are masterpieces. They can be easily passed off as the interior of a palace. This tour selects the very best examples for your - stop and admire the mosaics, the chandeliers, marble and statues and wonder just how long they would last in a typical western city. Located in the historical center of Moscow, the Old Arbat is arguably one of the city’s most famous and beloved streets. The Arbat was first mentioned in Moscow’s chronicles in 1493. The Arbat used to be a suburb where traders and craftsmen arrived. Indeed, the names of the side streets crossing Arbat are a testimony to that, such as “Plotnikov,” which means 'Carpenter’s', and 'Denezhny' or 'Money lane'. In the 18th century, the Arbat became Moscow’s most aristocratic and literary neighborhood. The famous Russian poet Aleksandr Pushkin lived there with his wife Natalya Goncharova. The building where they resided is now a museum. A statue of the couple outside it reminds passersby of its history. Elaborate facades are abound in the Arbat area. In the 1980s road traffic on Arbat was closed off, making the Arbat a popular pedestrian walkway and a meeting place for street musicians and artists. Along the Arbat you will also find the monument to the poet Bulat Okudzhava, who dedicated a number of affectionate songs to the street. Nearby is a wall that stands as a memorial to singer Viktor Tsoy, one of the pioneers of Russian rock, who died in a car accident in 1990. Founded in 1524, Moscow’s Novodevichy (New Maiden's) Convent is undoubtedly one of the capital’s biggest tourist magnets and the thrilling Must-See tourist destination. A cluster of sparkling domes, large sculpted monuments and chapels, it actually feels more like a huge open-air museum. From the outset, Novodevichy was special among Moscow’s monasteries, becoming a place of refuge for noble women and a prison for rebellious royals. The Convent’s oldest structure is the huge five-domed 16th-century Cathedral of Our Lady of Smolensk. Definitely it is the architectural marvel. In 1812 during the war with the French Napoleon ordered the entire complex be destroyed, though, fortunately, it did survive. During the Soviet years the convent was turned first into a Museum of Women’s Emancipation and then into a history and art museum. Yet Novodevichy was one of the first to be returned to the Church as a reward for backing the war effort – services here resumed in 1945. As soon as the convent was founded, a cemetery was opened on its grounds, which immediately became a burial place for noble families, feudal lords, and church officials. In 1898, it was expanded beyond the convent walls and rapidly became Moscow’s most prestigious burial site. One of the first famous Muscovites to be buried there was 19th century short-story writer and playwright Anton Chekhov. There are also the graves of Russia’s iconic writer Nikolay Gogol (relocated) and opera singer Fyodor Shalyapin. Although during Soviet times, the cemetery became Russia’s most high-profile, only one Soviet leader – Nikita Khrushchev – is buried there. Soviet leaders were traditionally buried alongside the Kremlin Wall in Red Square, although this honor is reserved for those who died in office. Khrushchev was removed from power in 1964 and when he died seven years later, he was denied a state funeral and a place next to his predecessors. Since the fall of the USSR, the cemetery has been used for the most symbolically significant burials. Russia's National Gallery is unquestionably a world-class collection displayed in world-class surrounding. The State Tretyakov Art Gallery is home to the most superlative collection of Soviet and Russian art to be found anywhere in the world. The Tretyakov Art Gallery was the first museum of painting entirely dedicated to Russian works of art. Opened by the Tretyakov brothers in 1893, the Gallery now houses over 170 thousand exhibits. The collection of Russian icons is indisputably the finest in the world. Kolomenskoye is one of the most popular parks in Moscow. Every year the estate hosts a number of festivals and celebrations. Kolomenskoye is the former royal estate where generations of Russian czars have left their mark. The estate is filled with splendid palaces and beautiful churches that are definitely worth exploring. The oldest surviving structure among them is the Church of the Ascension described as the beauty of perfection. it was in the mid-17th century that Czar Aleksey I, the father of Peter the Great, turned Kolomenskoye into a lavish Summer residence. Under his orders, a magnificent wooden palace was built. Dubbed “the Eighth wonder of the world,” it represented an intricate combination of more than 200 richly decorated chambers while two mechanical lions at the gates greeted guests with a roar. The palace adorned Kolomenskoye for 100 years until Peter the Great moved the capital from Moscow to Saint Petersburg. In the 1920s the estate became Russia’s first open-air museum of wooden Architecture. A small corner of rural life in the center of Moscow still charms with the presence of Leo Tolstoy's spirit. In 1882 Leo Tolstoy's large family moved from his ancestral estate at Yasnaya Polyana to Moscow where they resided in this wooden house till 1901. Leo Tolstoy's hospitable Moscow house received many of his distinguished friends. Sergei Rakhmaninov, the world renowned opera singer Fyodor Shalyapin, Ilya Repin, Maxim Gorky and many other celebrities were the guests of Tolstoy family. This unique museum is where some of the most precious examples of Russian Orthodox art are displayed. The museum is located on the grounds of the Andronnikov Monastery founded in the 14th century and long considered one of Russia's most important religious centers involved in many of defining moments in Russian history. Within the walls of the monastery is the Cathedral of The Savior built at the start of the 15th century and decorated by the legendary icon painter Andrei Roublev. The museum was especially designed to resemble an ancient temple with its typical facade and columns of that style. This is Moscow’s premier foreign Art museum showing off a broad selection of European works, mostly appropriated from private collections after the revolution. The Pushkin’s collections are located not only in this main building, but also in the Museum of Private Collections and the Gallery of European & American Art of the 19th & 20th cc. To see the incredible collection of Impressionist and post-Impressionist paintings, visit the Gallery of European & American Art. What’s left in the main building is still impressive, especially since the place has been revamped, with more modern museum lighting and improved layout. Moscow has all the reasons to boast a remarkable array of museums and places in and around Moscow devoted to Pushkin, Tolstoy, Dostyevsky, Bulgakov, Gorky and scores of other Russian writers. Moscow regularly plays host to the prestigious International Tchaikovsky Competition of pianists, celloists and violinists. The competition proudly carries the name of the Russian composer Petr Tchaikovsky, the author of the Nutcracker, the Swan Lake, to name a few. Of all the monasteries in Russia, none is holier than the Trinity Monastery of St. Sergius, in Sergiev Posad. One of the powerhouses of Ancient Russ, this historical and religious town just 70 km north of Moscow is one of the oldest seats of the Russian Orthodox Church and still one of the most important pilgrimage centers in the country. The picture perfect skyline is dominated by the blue domes of the Assumption Cathedral contained within the impressive white stone walls of the tranquil working monastery complex. The Central Air Forces Museum located approx. 85 km outside of Moscow in Monino, is one of the biggest aviation museums in the world. It has an extensive collection of Russian and Soviet warplanes, as well as unique airframe prototypes. This is a separate full day trip that requires advance reservation. The Space Mission Control Center is located approx. 70 km north east of Moscow, close to Monino Air Force Museum. Travel some 300 km north east from Moscow and get a true feel for Russia on this fantastic full day trip of one of the best known routes encompassing the two most picturesque medieval towns of the historical Golden Ring. Vladimir is one of the main towns on the Golden Ring, a loop of very old cities northeast of Moscow. Founded in 1108, 40 years before Moscow, Vladimir was a flourishing cultural center dotted with magnificent churches and cathedrals. It was destroyed by the Tatars in 1238 and 1293, and slowly fell in importance as Moscow became more prominent. Today Vladimir looks like many provincial Russian towns and is used primarily by tourists as a stopover en-route to the more picturesque Suzdal. City's key landmarks are the Golden Gate (Zolotije Vorota) and the Assumption Cathedral. Behind the Golden Gates is the medieval Assumption Cathedral built between 1158 and 1160. In the 1470's the Italian architect Aristotle Fioravante was instructed to use it a model to build the Moscow Kremlin's own Assumption Cathedral, the principal church in Russia over the centuries. Though the Assumption Cathedral has a strikingly simple exterior, one of the most exalted treasures inside is a fresco of the Last Supper by Andrei Rublyov, the Russian master known as the founder of icon painting in Old Russia. Fifty-three kilometers north of Vladimir, Suzdal is a charming little town famous for its monasteries, churches and convents. This is what Russia might have looked like if communist architecture had not prevailed. Almost fairy-tale like in appearance, the oldest buildings are located in the Kremlin, which was founded in the 11th century. The most remarkable is the Nativity of the Virgin Cathedral, built in 1225 with its stunning blue domes spangled with gold. A fine collection of icons can be found in the Archbishop's Chambers. North of the Kremlin is the Pokrovsky and Spaso-Yefimyevsky monastery; off the main square are the Rizopolozhensky monastery and Alexandrovsky Convent. Yasnaya Polyana (Clear Glade) was Leo Tolstoy's sprawling country estate. Located 240 kilometers south of Moscow, the complex is one Russia's most famous literary landmarks and houses the Tolstoy House Museum and Tolstoy Literary Museum. It was here that this famous writer was born, spent most of his life and is buried. The large unkempt grounds are marked with little green signs displaying fragments of prose or poetry inspired by that particular location. The Tolstoy house is a modest two-story building preserved in much the same manner as it was before the writer's death in 1910. One of the main attractions is the study where he wrote War and Peace and Anna Karenina. A short walk from the main house is Tolstoy's unmarked grave — a raised grassy patch fenced off by cherry trees. An estimated 100,000 soldiers from both sides died that day and the French went on to capture the abandoned city of Moscow. But the toll the Russians took on Napoleon's forces at Borodino eventually proved too much, and with winter as their ally, the Russian troops beat the French into submission on their arduous trek back to Paris. History buffs can walk you through the entire battlefield, with more than a 100 square kilometers marked with obelisks dedicated to the fallen units on both sides. There is also a collection of bunkers, some dating to back to World War II when the Germans followed Napoleon's footsteps. The nearby Borodino Museum offers a miniature overview of the battlefield. The village of Peredelkino was originally a part of the pre-Revolutionary Kolychev family estate. After the Revolution the Soviet Writers Union took it over and converted it into a writers refuge. 20 kilometers southwest of Moscow, Peredelkino today attracts tourists who wish to see Boris Pasternak's dacha. Now called the Pasternak House Museum, the wooden dacha has been kept as it was in Pasternak's day С the iron bed where he died, the study where he wrote Dr. Zhivago and the bookshelves where the works of his favorite authors sit gathering dust. We would also like to introduce to you some less known, - though equally interesting, - places and sights in Moscow that you might also want to visit. Do you know that the beautiful Botanical Garden in Moscow is the largest in Europe? Moscow's Botanical Garden is the perfect place to get away from the capital's hustle and bustle. The main Botanical Garden of the Academy of Sciences, as it is officially called, is Europe’s largest, occupying twice the size of Monaco. The country’s botanical gardens were traditionally under the patronage of the Russian royal family. The Soviet authorities, however, managed to outdo the Czars both in scope and in grandeur. The chosen area, now in Moscow’s north, was once far outside the city and a popular place for the country homes of Russia’s nobility. In the 18th century, it became the property of the very wealthy Sheremetyev family. A large park was laid out and five ponds were created. It took 15 years to lay out the garden, which was opened in 1959. Around 18,000 plant species from across the Soviet Union and around the globe were gathered. Walking here was meant to feel like taking a tour of the entire northern hemisphere – from North America to Russia’s Far East and through central Asian deserts. In order to build up the garden’s collection, its staff crisscrossed the world on their hunt for rare and exotic varieties. The garden is now a botanist’s treasure trove, but you can enjoy it even without any special botanical knowledge. Although the garden is more of a living museum than an amusement park, it is perfect for getting away from the noise and stress of urban living. Once inside, it is hard to believe that the garden is surrounded by the hustle and bustle of Moscow’s densely built-up northern suburbs. The garden’s founders did their best to preserve the area’s beauty and history – even the garden’s research lab was styled to look like a Russian count’s palace. The park’s highlights also include a glorious oak grove with trees aged up to 200 years old and a Japanese garden that opened in 1987. Laid out by Japanese designers to bring an exotic touch of the Orient to Moscow, it has always been a hit with visitors. the miniature Soviet Union can be found in the heart of the Russian capital? Visit All-Russia Exhibition Grounds, also known as VDNH, an abbreviation for the Exhibition of Economic Achievements of the USSR. Grand and extravagant, the biggest exhibition center in Moscow is the place where history, business and entertainment walk side by side. Despite the rather formal and pompous name, the All-Russian Exhibition Center is a fascinating place. Its sheer size puts to shame some European states, beating the Vatican and Monaco. It all began in 1935, when Joseph Stalin set out an ambitious plan to create a life-size model of a perfect city. The new center proved a booming success. It showcased the Soviet Union’s agricultural achievements. And each pavilion represented one of the union’s republics. The idea was that visitors, walking from one pavilion to another, had a tour of the Soviet Union. After World War II, construction work started again. Every building had to celebrate the Soviet people’s victory in the war. A brand new entrance – the Triumphal Arch – sprang up, topped by a Sculpture of a Worker and a female collective farmer that fast became the exhibition’s symbol. Each pavilion was now dedicated to a key Soviet industry: Timber Industry, Atomic Energy or Shipbuilding. The center’s look has not changed much since then. After you pass the main entrance, a fountain-lined alley leads to the “Central” pavilion, crowned with a star. There is also a statue of the leader of the Revolution, Vladimir Lenin, nearby. The square behind is dominated by a massive fountain, called “The Friendship of the Peoples,” where statues of young women in national costume represent the Soviet republics. Further on there is another fountain, “The Stone Flower,” inspired by fairy-tales based on the legends of the Urals. Then there is also the “Aerospace” pavilion built to celebrate Soviet space exploration. There is even a copy of the “Vostok” launch vehicle used by Yury Gagarin, the first man in space. An entire day was not enough to see the grandiose complex. Special buses were used to travel around it. With the break down of the Soviet Union many pavilions fell into decay and were rented out, with the exhibition becoming a giant money-making machine. Now the center is a monster market and a bargain hunter’s paradise. Founded in 1960s, the Central Museum of Armed Forces has more than 20 halls filled with thousands of items, and there is also a large outdoor display. It traces the history of the Czarist army and the Russian Civil War, focuses on World War II, from Soviet propaganda posters to weapons and banners captured from the Germans. One of the displays is dedicated to the 1941 Moscow parade. Stalin insisted on its being held even as the Germans closed in on the city. The troops left Red Square to head straight to the front line. Part of the Great Patriotic War section is devoted to the 900-day Siege of Leningrad, one of the most arduous in world history. It became a major symbol of Soviet resilience. There is also a section dedicated to The Battle of Stalingrad, the turning point in the WW II that cost Russia an estimated 2 million. The city’s very name drove Hitler’s obsession with it. The Soviet losses here were so great that at times the life expectancy of a newly arrived soldier was less than a day. The culmination of the World War II display is the Victory Hall, celebrating the USSR Victory over Nazi Germany. The most treasured object here is the actual Victory Banner raised in Berlin in May 1945.